We had an interesting event at OpenText on Friday. It was the celebration of OpenText’s 20 year anniversary combined with the official unveiling of our new building. All kinds of important folks showed up - from the early founders and key managers to local, provincial and even federal politicians. The part that I enjoyed most was the panel discussion with the founders when they reminded us about the early milestones of the company. Not many people know today that OpenText got started as a search company. The origins go back to a University of Waterloo research project led by Professor Frank Tompa - yes, as in 275 Frank Tompa Drive which is the company’s address in Waterloo today. The students under Prof. Tompa developed software to digitize the Oxford English Dictionary which led to the development of one of the first search technologies. 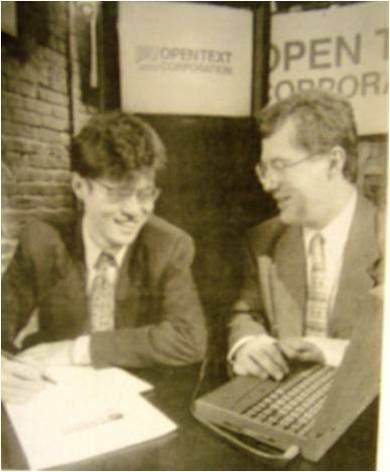 Since the team recognized early on the commercial application of this technology, a new company was incorporated in 1991, named OpenText. The founders of OpenText included Prof. Tompa, who’s still a professor at UW, Tim Bray, the co-author of the XML spec, and Gaston Gonnet who is today a professor at the ETH University in Switzerland. The team came up early on with the breakthrough idea to separate the search index from the content, which they referred to as “text” back then because, well, it was all about text in the pre-Web era. That allowed them to keep the index open to any type of “text” and - voila - that’s how the name “OpenText” came up. The decision to separate the index from the content is something we take for granted today but back then, it was groundbreaking. Being able to index any content in any repository paved the path towards the then nascent document management systems. It was not a surprise, that OpenText soon got its own document management system by acquiring Odesta with its flagship product Livelink. At the same time, OpenText made a decisive move to the Web and built a Web crawler that enabled indexing HTML pages on the World Wide Web. One of the milestones became a deal when the red-hot startup Yahoo! licensed the OpenText search engine. Eventually, OpenText had to decide between the consumer-oriented Web and the enterprise, and chose to pursue the enterprise. Many new products and acquisitions followed but the search engine is still at the heart of most OpenText products including the Content Server which is the modern-day-incarnation of Livelink. The rest is history and OpenText is a billion dollar company today. It was great to hear this story from some of the original founders, such as Prof. Tompa, Saman Far who was employee number 4 and Daniel Cheifetz, the founder of Odesta. As Tom Jenkins likes to say, knowing the history helps to understand the vendor’s strengths and weaknesses. Tom would know - he’s the OpenText chairman and Chief Strategy Officer and he’s been with the company from the very early days.